Ugee UG-2150 is a very good Cintiq alternative, both when it comes to the price & what to it provide you when it comes to drawing area & experience. The screen offers a large enough area to draw to your heart content. The slippery screen surface is something you will either like or dislike, depending on your preferences. The lack of hot keys on the top of Ugee UG-2150 may be a deal-breaker for some artists, but you will be fine if you plan to use the keyboard or some other method. The reflective nature of the screen can be a bit annoying, unless you can place it where no direct light falls on it. The HD resolution is also good as well. The amount of pressure Ugee UG-2150 provides is more than enough. Don’t listen to those that tell you to get the pen display with the highest pressure sensitivity; it’s just a waste of money (unless that pen display is equal or better when it comes to the other aspects). There’s no tilt sensitivity for Ugee UG-2150, but that’s not something you need to have, especially if you’re new to digital art. The two pens that come with it need charging, but you won’t have to charge any of them too often. The replacement nibs for the nibs are also affordable, so you won’t have to worry about them being costly. Is a very affordable pen display if you want one to draw directly on screen. Offers a large drawing area for the price. Buying a replacement pen is very affordable. Has no hot keys at all, so you have to use the keyboard or some other method to get hot keys. Viewing Angle: About -80±, horizontally & vertically. Comes with a drawing glove to help you avoid smudging your screen. Compatible with Mac OS / Max OS X as well. Compatible with many drawing programs, like Adobe Photoshop, Adobe Illustrator, Autodesk Sketchbook, Corel Painter, Autodesk Maya, Pixologic ZBrush and more. 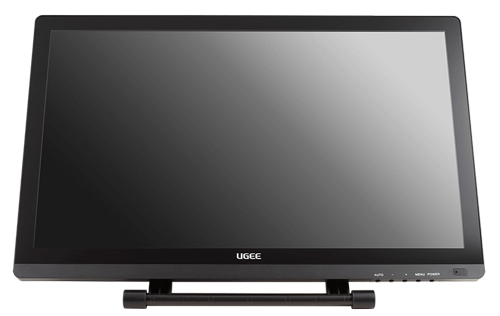 Ugee UG-2150 has a 21.5 inch screen which provides you with a large drawing area to draw to your heart contents. The large drawing area allows you to draw with your arm, as well as your wrist, whatever you want. Larger drawing area also means you won’t have to zoom in as much as in case with smaller drawing areas. There’s no need to worry about the drawing area being too big, as you will draw on a small part of it in that case, it won’t get in the way of your drawing. The screen resolution, 1920 X 1080, is more than enough for drawing as well, but I hope to see higher screen resolutions from Cintiq alternatives in the future. The screen surface itself is glassy, which means drawing on it is slippery (if you ever drew on glass, you will know what that means). Whether you like that or not depend on your preferences. If you want some friction between the screen & your pen, you could buy a differently textured screen protector and apply it on the screen. There’s one more thing you may really dislike about the glassy screen, which is the way it reflects light & turn into a mirror, which is annoying no matter the case. If you plan to use Ugee UG-2150 indoor, then you can just place it away from windows or direct light sources. This issue above applies to all glassy screens, not just Ugee UG-2150. So knowing this can help you when you get to buy a monitor (which is outside the scope of this post). Ugee UG-2150 supports 3 display ports, which are VGA, DVI & HDMI. That means you are unlikely going to encounter an issue connecting it to your computer, since most computers have at least one of these ports, or have a port that can be converted to one of the ports, like Displayport & mini-DisplayPort. For example, if you have a Mac, you will either have a USB-C or mini-Displayport in it, which can be easily converted to one of the 3 ports above. Ugee UG-2150 supports 2048 levels of pressure sensitivity, which is more than you will ever need. There’s a common misconception between some artists that the more pressure sensitivity a drawing device supports, the better it is. That’s totally not true. There’s a diminishing return when it comes to pressure, and we have reached a stage where we won’t benefit much from higher pressure. The only time you should go for a pen display with a higher pressure is in case it is much better in other aspects. What’s pressure sensitivity:- It’s a feature that allows you to draw thicker or thinner lines by varying the pressure you apply with the pen. For example, you can draw thick lines by pressing the line hard, and thinner lines by pressing lightly. For pressure sensitivity to work, your drawing program needs to support that feature. Most drawing software these days support it, including many free ones. Unlike pressure sensitivity, Ugee UG-2150 doesn’t support tilt sensitivity, but this is not a very important, especially if you are new to digital art. It’s nice & advisable to try this feature in the future when you get the change to. What’s tilt sensitivity? It’s a feature similar to pressure sensitivity. It makes you tilt the brush you’re drawing by tilting the pen itself, which changes the stroke shape, depending on the brush itself. For tilt sensitivity to work, the brush you use needs to support it. If you’re new to digital art, and especially drawing with a pen display, there’s some parallax you need to be prepared to deal with. There’s a slight parallax you are going to face when drawing with Ugee UG-2150, which is parallax. What’s parallax? It’s a slight offset between the pen tip and the strokes that appears on the screen. This offset is often caused by the screen glass, and so the thicker it is, the more parallax you could get. Parallax can appear more around the screen corners as well. Parallax makes it less intuitive to draw digitally, but it’s something you could get used to after some time. Even with some parallax in your pen display, drawing with it is still easier than drawing with a regular graphics tablet. Ugee UG-2150 has no hot keys on the top of it, so it you use hot keys to access different shortcuts, you may be disappointed with that. A nice solution to that is to place the keyboard nearby, and type the shortcuts that way. This is something many artists do, even some of those who own a pen displays with hot keys on them, since they find the keyboard easier to use. Also, some of them need more shortcuts than any pen display can provide. Ugee UG-2150 comes with 2 pens to draw with, each of the two pens has two buttons you could assign to different shortcuts. These two buttons are the only kind of hot keys you get from Ugee UG-2150. Each pen needs to be recharged from the cable you plug at the back of it (you get two of these). The amount of time each pen lasts is long, so you won’t have to charge them very often. So far, the only company, other than Wacom, that provides a passive pen that doesn’t require charging is XP-Pen (Unless there’s one I totally missed). Having 2 pens means you will have a replacement in case something happened to one of them. Speaking of that, I checked the price to replace the pen in Amazon, and it was really cheap. This is also the case for XP-Pen & Huion pen displays too. Especially comparing to the price of Wacom’s pen replacement. There’s no eraser at the back of the pen, but you can use a keyboard shortcut or one of the two buttons to switch to it. Ugee UG-2150 comes with a pen holder where you could place the pen when you aren’t drawing with it. Inside of it, there are 8 replacement nibs. Replacing the nib is important in case it gets pointy, you do that particularly to avoid scratching the screen. The amount each nib lasts depends on the screen surface, as well as how much you press the pen on it (it’s worth noting that glassy screens are harder to scratch). Since each pack of 10 nibs won’t cost you much, there’s not much need to worry about nibs costing you so much in the long term. Sometimes your hand can rub on the screen as you draw. For that reason, Ugee UG-2150 comes with a glove that covers the lower part of your hand, which can make it easier for you to draw. The glove can prevent you from smudging the screen as well. While users of regular graphics tablets can also appreciate such glove (many graphics tablets come with one). In the case with pen displays, the fact you constantly look at the screen while drawing makes it important. Since the glove comes with Ugee UG-2150 out of the box, it won’t hurt to try it out to see the difference it makes. 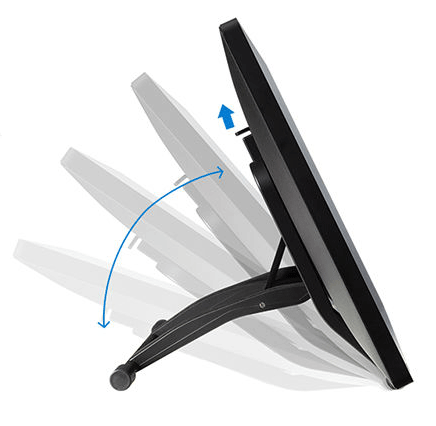 At the back of Ugee UG-2150, there’s a stand that allows you to tilt Ugee UG-2150 backward & forward. While the stand is similar to the one you see with Huion pen displays, it’s slightly different actually. Ugee UG-2150’s screen is suspended with this stand, and is not touching the desk like other similar pen displays. This is to hopefully prevent cables from getting squashed when you lay Ugee UG-2150 flat or semi flat (it still happens despite that, placing the display ports on the side would have been a better solution, something many similar pen displays did). To adjust the stand, all you have to do is to lift the button on the top of it, and you’re good to go. 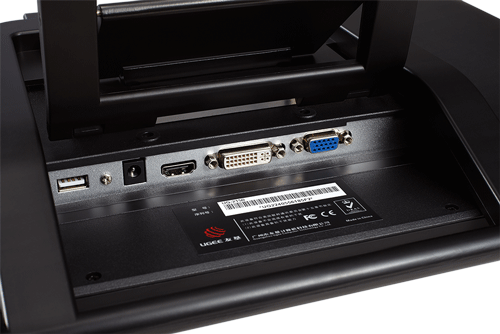 In case the stand that comes with Ugee UG-2150 is not enough for you, you can actually detach it, which reveals a 75 X 75 VESA mount. This makes it very easy to mount it on an arm. This gives you all sort of flexible movements (you can even use that mount it mount it on the wall too, but I don’t see a reason for that). Besides parallax and the possibility of getting a defective units (which the manufacturer usually replace for free), driver issues is an area where you may end up disappointed with Ugee UG-2150 when things don’t go well. For that reason, I have included some tips that will hopefully make your life easier. First of all, it’s advisable to download the latest driver from Ugee’s website, as that tends to be more updated than the one that comes in the CD. Don’t throw the CD just yet, as having more than one driver version can help you solve the issue where the latest driver just doesn’t work. Another important tip to keep in mind:- It’s highly advisable to remove all the installed Wacom drivers from your computer before you install Ugee UG-2150’s driver. We do this in order to avoid any possible drivers conflicts, which is very common with Wacom competitors. Removing the drivers of other graphics tablets & pen displays makers, like Huion, Yiynova & Monoprice, is advisable too. In case you are wondering, Ugee UG-2150 will very likely work with many drawing software, there may be an issue with certain program here and there, but it’s generally good. 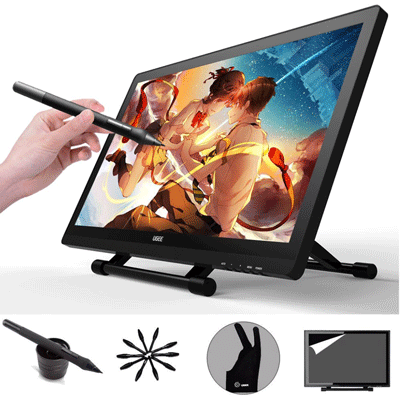 Ugee UG-2150 is an excellent Cintiq alternative from Ugee, you may have noticed I tend to review Ugee’s product rather positively, but that doesn’t mean they can never have issues, and so you should be prepared to face them in case you decided to buy Ugee UG-2150. As long as you’re fine with the lack of hot keys, some parallax and driver issues, and the possibility that cables could squash when you tilt it a bit too much, there’s not much features-wise to worry about that’s not mentioned in this Ugee UG-2150 review (If there is, tell me and I will include it as well whenever possible). Many of the things I mentioned in this Ugee UG-2150 review applies to similar pen display, this is not a coincidence, giving how some of them share components. While I think that Ugee UG-2150 is a really good option for hobbyists, I can imagine some professionals using it as well.